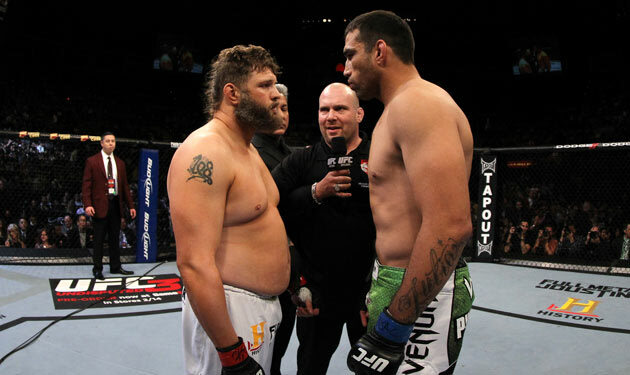 Discussion in 'UFC Discussion' started by BigMuffler, Dec 23, 2012. But don't people realize that carrying lots of muscle isn't necessarily 'natural' either - not making a generalized steroid accusation here, just that it takes hard work in the gym and EATING A LOT (just like with fat) to maintain a ton of muscle... so how is some body fat less 'natural' than muscle? Yeah maybe if Nelson never ate much as a kid he'd have an MW build... by the same token maybe if Shane Carwin (one of the largest HW's even though he's only 6'1) never ate much or lifted heavy weights, he'd be able to make LHW or MW. Nelson's clearly not a 'natural' HW, his frame isn't. Not that I care or think he could have better success at lower weight classes. Roy is fat as hell, and MW is simply not out of question at all should he burned that gut. He's certainly smaller than his opponents. Rashad is just powerfully build, completely different thing, not much to say. It's hard to say that Nelson or Fedor would necessarily have had more success at LHW without the 'extra' fat than at HW, or that a lean Mark Hunt would be better than chubby Hunt. Just think the critique of fighters as being 'fat' or 'naturally undersized' for their weight class is way overblown by some. Strength is important in MMA, especially when it comes to wrestling, so carrying around a lot of fat and facing opponents that weight just as much as you do, but without any bodyfat, is going to be tought. Whatever the drawbacks or benefits of carrying some body fat though, I don't think 'natural' is the accurate term to use... maintaining a very muscular physique requires a ton of work, in that sense a Nelson body is arguably more 'natural' than one like (insert ripped guy's name)'s that took years and years of dedicated lifting to build. Roy has lost a lot of weight as it is and you can clearly see the difference, but middleweight wouldn't be the right class for him light heavyweight is where he should be. Nelson isn't a natural MW, he's a natural HW. He's a professional athlete who does cardio, strength and fight training and is still fat and sort of obese. That's just his natural physique. What do you mean by 'natural'? He's fat beacuse he eats a lot of food. It doesn't hurt to have a little fat, not talking about Roy Nelson level, but too much muscle can take away from your cardio. Lol you really think he fully dedicates and commits to cardio and proper dieting? No way he would still look like he does unless he's got some metabolism problems. Meh, for a while he dropped down to about 235, but he was 250 for his last fight and I think it's safe to say he's decided to embrace the fatass HW thing. Whatever, he's still doing well against non-Top 10 opponenets. True. And fat still gives you weight which you can use for punching power and leverage in wrestling etc. You can do cardio for 15 hours a day and still look like a whale, you just have to eat a lot of food. Guys with big muscles have to eat a lot of food and weight train extensively to stay that way, hence they're not any more natural yet only 'fat/chubby' fighters are criticized for being in a higher class than their 'natural' one. I've got a natural "Fedor" type build, have my whole life. I tried to get that "Kongo" build going on for a time but it never did anything good for me. My energy levels were down, it felt like all my food was grown in a lab, and I actually lost strength. I'm not a pro athlete but I surround myself with intelligent/competitive people from lots of different martial arts backgrounds. I know first hand what works and what's a gimmick used to drive up sales at GNC. As for the pros, Roy and Fedor know more about their own lives and bodies than we ever will. When people are talking about a fighters "natural weightclass" they are talking about what weightclass their frame is suited for. Penn is a natural LW, Nelson a natural MW, Fedor a natural LHW etc.